Alpine Beer Co. – Alpine Duet 12 oz. bottle poured into an imperial pint – 7% abv. 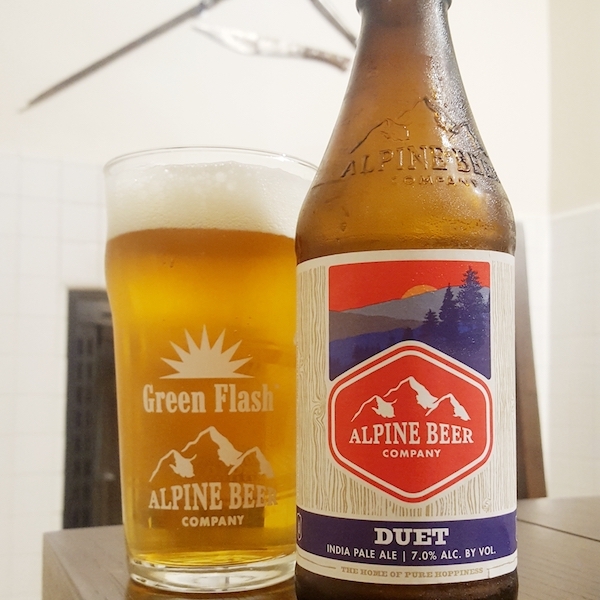 I’ve taken a long hiatus from buying Alpine bottles since the Green Flash takeover, so it is probably time to revisit my favorite of Alpine’s beers, Duet. Originally packaged in single 22oz bombers, the Green Flash takeover brought this recipe to a larger audience with wide distribution in 6-packs of 12oz bottles. Perhaps it will be packaged in cans soon as well since Alpine has recently been canning Truck Trail pale ale and Willy wheat. Unfortunately, these bottles have no bottling date – just a best before date reading Nov 30 2017. Not very helpful as the “freshness period” is unknown. I can say with certainty that Duet, an IPA, brewed in July is not going to be any good at the end of November. It’s the same deal with Green Flash bottles. That’s a big turn off for me. Duet is clear, bright gold in color generating a rich, white head with good retention and lacing. It looks perfect. In the aroma, it is maltier than expected with thick honey, Hawaiian bread rolls, fresh grist, and something herbal like chamomile and mint. It’s a bit strange, but nothing of concern. 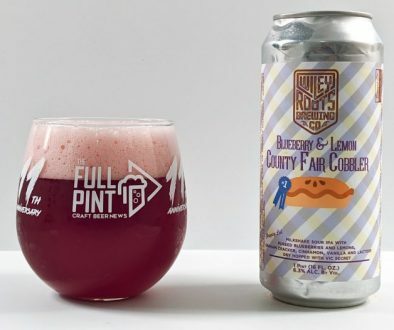 The flavor begins with a small alcoholic bite, settling down to starfruit and softer flavors of vanilla cake and buttercream frosting. It’s mildly bitter and there is great balance with touches of sugar. The IBUs are listed a 45, which is lower for the style. 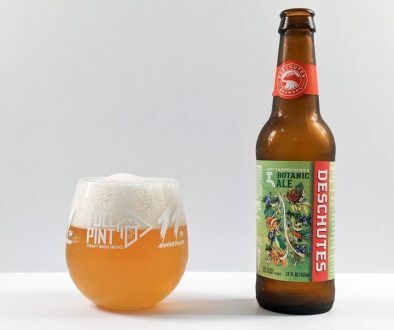 The mouthfeel is slightly salty and buoyant giving it a soft body rather than the aggressively bitter, nutty, heavy bodied IPAs that continue to dominate the market. In the mid-palate and finish it’s a bit chalky and dry but never harsh or astringent. That makes me think this bottle isn’t super fresh. With that said, it is still very good and refreshing in a way I would expect from an APA or Session IPA. I think this larger batch, Green Flash-brewed version captures the original recipe well, though it lacks the perfection of the original. Namely, it lacks in the aroma department. Overall, this was highly enjoyable even if not at peak freshness. Thanks, Andy, for the comment. I’m not a fan either of the Best Before dates and I had back to back with this Alpine Duet some Green Flash Soul Style with the same November 2017 Best Before date, and it was not super great. And the Duet was good, but not great in the aroma. So it’s tricky for me to say, go out and buy Duet, especially with so many other beers out there locally in the same segment. There’s no doubt the original one was legendary and this version doesn’t capture it 100%. It captures it just enough for me to have liked it, but I’m still not sure if I would go out and buy it again or recommend it someone. I think you should give it a shot if you can and see for yourself. My guess is that the Best Before date is 6 months. So fresh ones bought today should read January 2018 if my theory is correct. 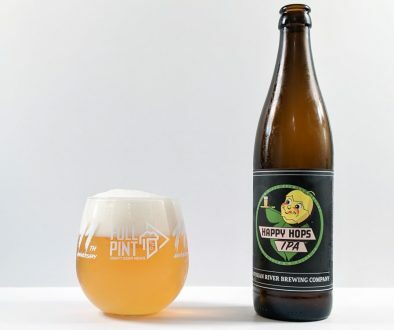 I’ve been hesitant to buy any of the Green Flash Alpine beers I see on the shelves because I’m worried about quality (which, from experience drinking the Green Flash Alpine beers, has been somewhat disappointing, at least compared to the original Alpine brews) and freshness. Glad to hear this one was good. Maybe I will consider it when I make my next beer run. Freshness is such a problem these days. 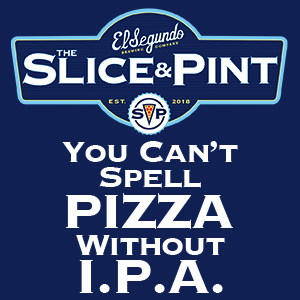 You really have to be careful and only buy IPAs with a bottled on or canned on date. Really appreciate Stone for doing that. Wish all the brewers would do it. More and more are but too many still don’t. And the “best before” dates some brewers do is really not helpful because you don’t know how old it really is.